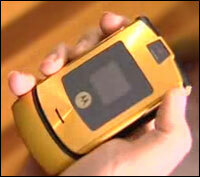 Motorola today announced a special limited edition version of the RAZR V3i that sports a shiny gold exterior. Dolce & Gabbana is the exclusive retail partner for the phone and there will only be 1000 units made. Pricing for the gold RAZR was not announced, but we expect it will be very expensive.